You've probably heard it before at work or in another context: "Proper Planning Prevents Poor Performance." 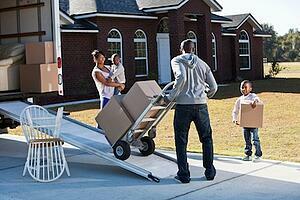 Have a game plan ready so you don't have to waste time on moving day trying to figure out what goes where. Some larger pieces are easier to move if you disassemble them. For instance, remove the drawers from dressers, desks and filing cabinets. Place screws and other hardware in sealable sandwich bags and secure them to the corresponding piece of furniture. The natural inclination is to stuff as much as possible into each box, but it's actually counterproductive if they end up being too heavy for anyone to lift. Be careful when packing items like books to make sure no one throws out his or her back trying to move them. Each person should have an assigned job to prevent bottlenecks. Have one or two people stationed on the truck at all times and divide the others between packing and carrying. Appliances and other heavy items should go into the truck first so they have plenty of support. Follow those with long items such as couches and beds, which should be placed on their ends along the sides of the truck to take up less space. Secure items with bungee cords or straps as needed. Once the larger items are set in a rough u-shape, fill in the middle with tables, chairs and heavier boxes. Think of the rest of the job as a game where you're fitting smaller boxes and the other "pieces" into the remaining spaces. Pillows, couch cushions and items packed in plastic bags make good "filler" as buffers to protect furniture. If you have bookshelves or any other shelving units, don't let that valuable space go to waste. Get some boxes that fit the shelves and use them as packing areas. 10. What DOESN'T Go on the Truck? Items that are fragile, valuable or need to be readily accessible should go in the cab of the truck or in a vehicle. We want your Springs move-in day to be as stress-free as possible. Talk to a member of our on-site management team about truck parking spots and other details to smooth out the process.